When you are hunting for laminate for a countertop, be sure to check that it is specified for “horizontal” use. Some laminates are made just for “vertical” use — intended for commercial customers who want to put them on walls or the sides of things that don’t get much pounding. Kitchen and bathroom countertop need the durability, though. 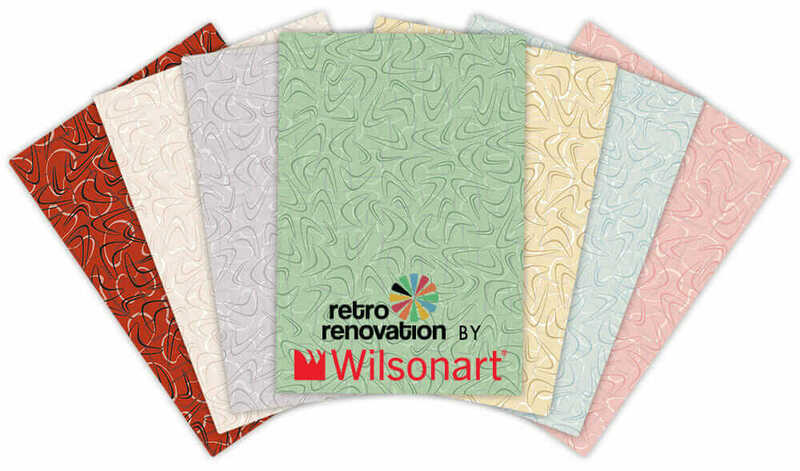 Lab Designs is a laminate maker that has a growing number of laminate designs — and has two laminates — Ebony- and Ivory Retro — that were previously ‘vertical’ now available, ‘horizontal.’ Both are nice options for Retro Renovators. Above: Lab Designs’ Retro Ebony laminate sample sitting on my existing countertop, tucked up against my stainless steel edging, with my vintage Kitchenaid dishwasher below. Looks nice, huh (though I wouldn’t pair a jaspe floor with a jaspe laminate countertop in real life. Above: The company sent me samples. They are shown above on my kitchen table, unretouched, natural light. I just received my requested samples from Lab Designs. 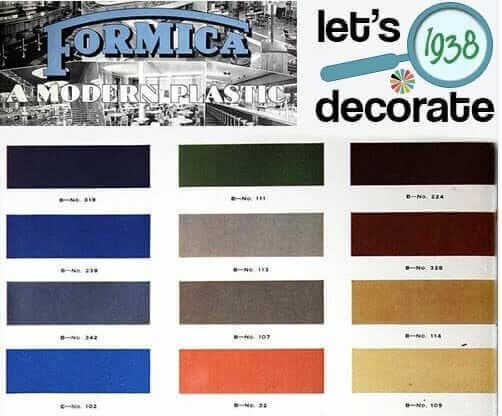 They now have Ebony Retro in matte or high gloss for HORIZONTAL surfaces. I was debating between that pattern and the Black Pearl pattern. Unfortunately, the Black Pearl gloss is vertical only. I also got a sample of the Black Celestial – gorgeous flakes of mica! BUT…vertical only. The horizontal-grade laminates have a matte finish, although I’d call it more of an eggshell. 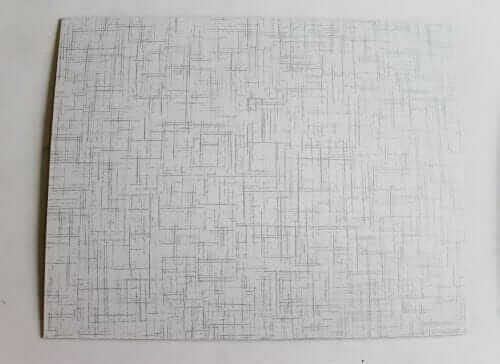 I think it’s quite nice. 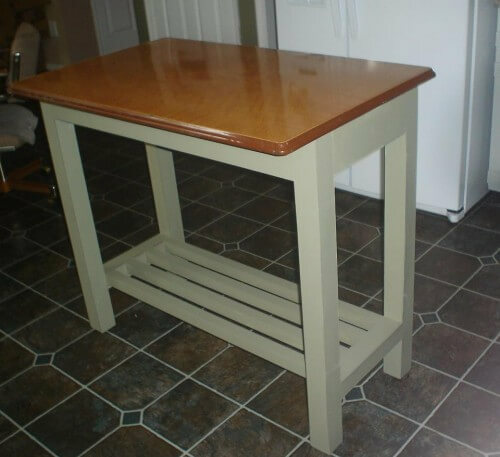 Over the many years of this blog, many readers have bemoaned that finishes on various laminates available today were not high-gloss, like they remembered from back in the day. This doesn’t bother me at all. I have matte-finish Formica aqua Skylark boomerang on my kitchen countertop, and it’s dandy. High gloss shows scratches and scrapes much more so than a matte or satin finish. 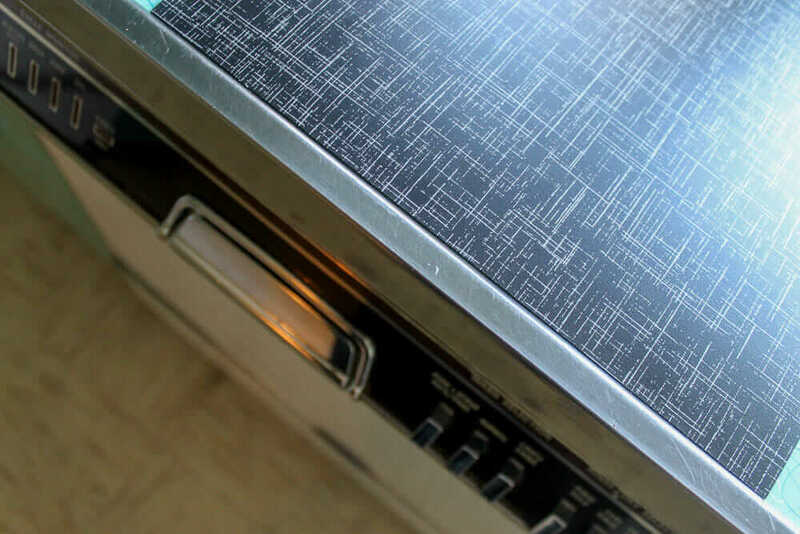 I also tend to believe that lots of countertops back in the day were actually what I am told was called a “furniture” finish. This had a lot of sanding and a lot of coats of melamine. Ya ain’t gonna get it today, no one would be willing to pay what it cost. Back to the two Lab Design laminates. I would call these retro-modern or retro-contemporary — not true-retro. The design has a “today” feel more than a, say, 1958, feel. Why? The lines of this laminate are too… literal. More like a photograph, less like an illustration. More of a fine point. 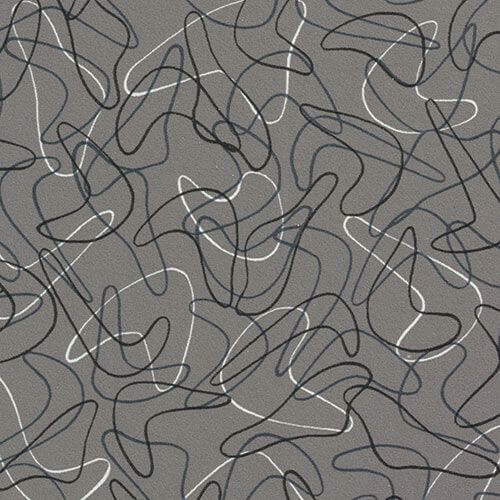 Still available today as a stock laminate, Brook Stevens’ Skylark design for Formica. 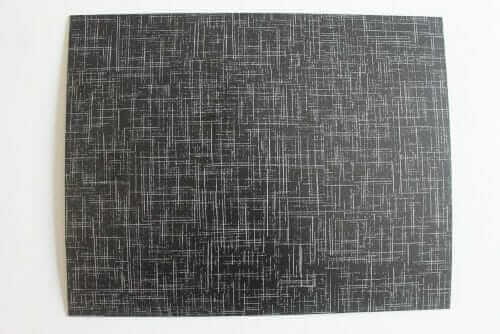 Alas, the only color that sold enough to keep making after an 00’s try: charcoal. Dogbone White is another “document” design you can still get today. In addition, retro-modern because: No real color-color. And dar-nit, I wish that the off-whites in more of today’s abstract laminates were yellow-off-white not gray-off-white. Gray-off-whites were just not much of a thing back in the day. 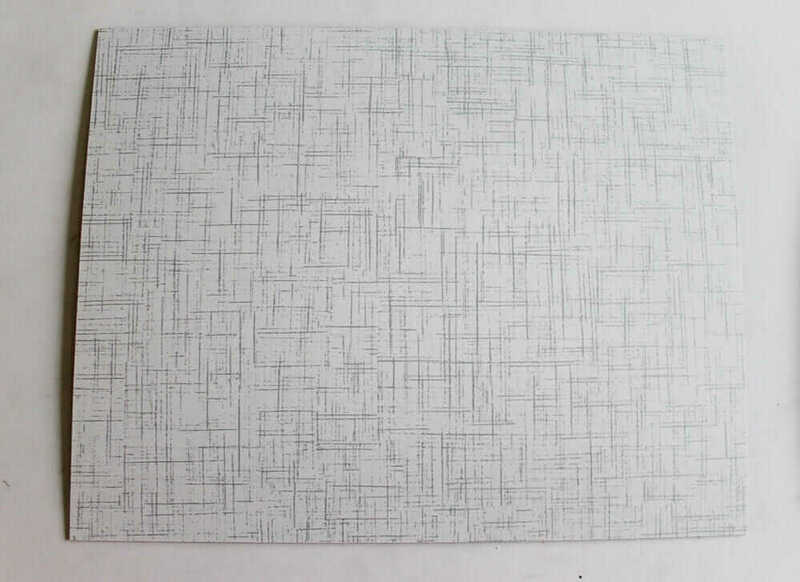 And you know how I feel about gray anyway. Even though they don’t quite pass my true-retro test (and so few do), I feature these two Lab Designs designs because if the colors are what you are looking for, they are worth considering, if you are okay with their retro-modern-contemporary direction. 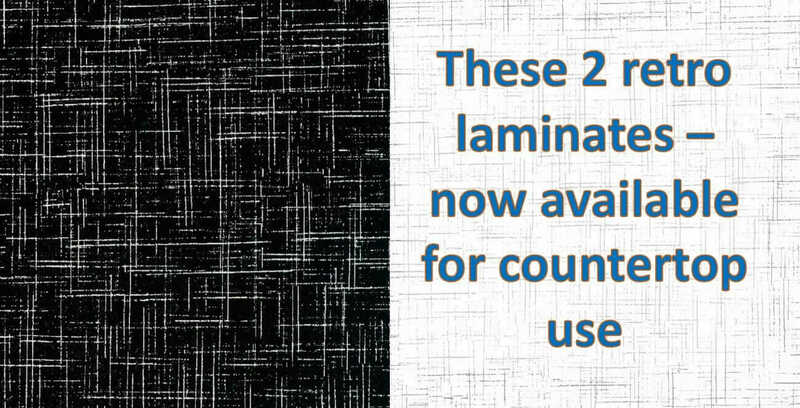 “Ebony Retro” and “Ivory Retro” laminates from Lab Design — get the horizontal grade >>listed among their Abstract collection here. I just realized how lucky I am to have original Skylark counters in lovely, GLOSSY yellow with teal and mustard boomerangs! Didn’t know till today that they now make only matte for “horizontal” use. These high-gloss counters are also bullnosed — no seam at the front. Wish I could get them some kind of historic protection so that someday, some misguided future owner can’t rip them out and put in concrete or some other of-the-moment design mistake!! Well, it is a promising start… but if they some green, blue, orange, red, pink, tan, cream and yellow colourways to that line up they would be getting there! Thanks for your comments about a more highly coated melamine finish on the old laminates. We are about to replace glossy white with gold glitter laminate tub/shower walls and ceiling (circa 1970) with Wilsonart pink boomerang. But I’m now wondering if the current product will be as water tight. Our supplier says that they are still installing laminate tub enclosures. What do you think Pam? I wonder if I should do pink tile instead (yuk – grout maintenance). I love this site! I think: Contact Wilsonart. 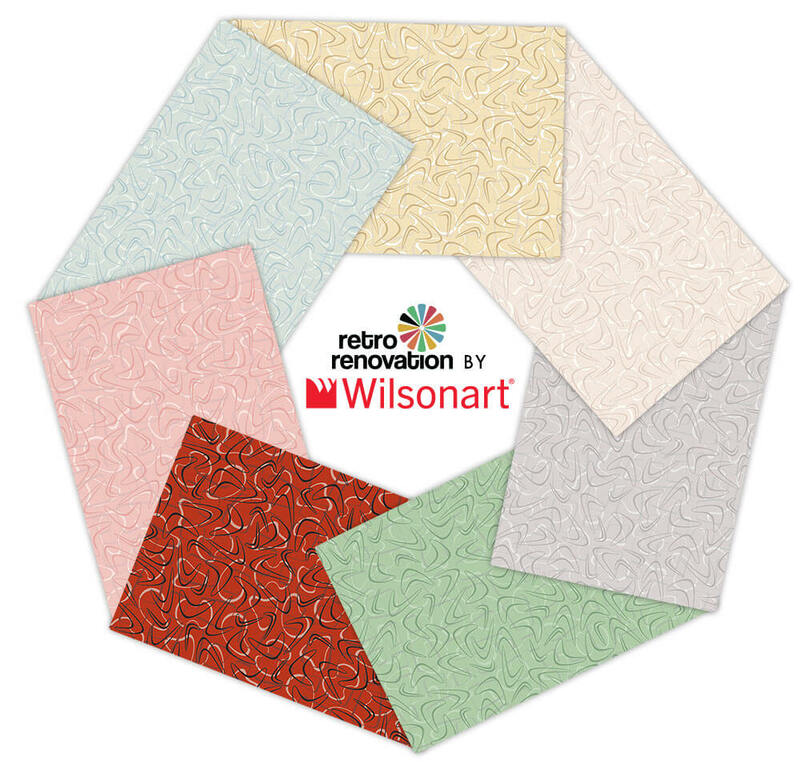 Note, it’s not Wilsonart pink boomerang, it’s Retro Renovation by Wilsonart First Lady Pink!